I got one of these http://www.adafruit.com/product/420 LED panels to mess around with. I think someone made an Arduino sketch or a Raspberry Pi Python library or something for it, but I'd prefer to make my own controller for it. Unfortunately I couldn't find any really good documentation that explains what needs to be done. A little playing around with it and I think I got it figured out so I figured I'd share my findings on here. I was originally wanted to use an ATtiny2313 but I needed 256 bytes to hold a full image and I wanted to do double buffering (512 bytes total) where the ATtiny2313 only has 128 bytes. I tried to order some ATtiny4313's but nobody had them in stock. 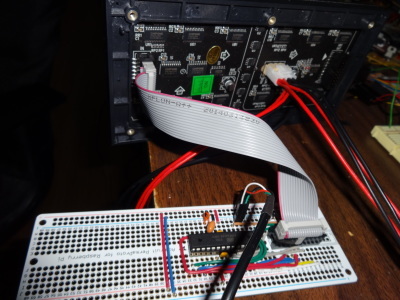 I ended up using an ATmega168 I had laying around. Basically this 32x16 LED panel can be thought of as having six 32 bit shift registers. Three of these shift registers work together to hold the red, green, and blue information for one line of LED's. This means that you can really only turn on two rows of LED's on this panel at a time. If my A,B,C pins on the panel are all set low, then whatever is in shift register 0 will show up on line 0 and whatever is in shift register 1 will show up on line 8. If I set pin A high and leave the rest low then line 0 and line 8 will turn off and line 1 and line 9 will display what's in the shift registers. So maybe a question is if I'm shifting bits into the shift register, how do I stop the LED's from displaying the bits as they are being shifted in? There are two pins used to control this. First is the latch pin. The bits won't get pushed to the output buffer until the latch pin is pulled high and then low. This means bits can be shifted into the shift register slowly but won't actually be visibile until latch pin is hit. There's also an output enable pin (which seems to be active low) so if this pin is pulled high, the LEDs will turn off. Here's the soldered circuit board connected to the LED panel.